A hearty autumn salad that can be eaten warm as a luncheon main course or a cold side plate. Either way, it's worth roasting extra pumpkin so you can make it again. 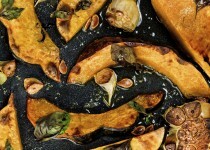 Butternut Pumpkin (or sugar pumpkin) - 1/2, cored, peeled and sliced into 1"
Coarse Sea Salt - 1/2 tsp. Roasted Garlic Sea Salt - 1 tsp. Apple Cider & Garlic Vinaigrette - 4 tbsp. Pure Maple Syrup - 1 tbsp. 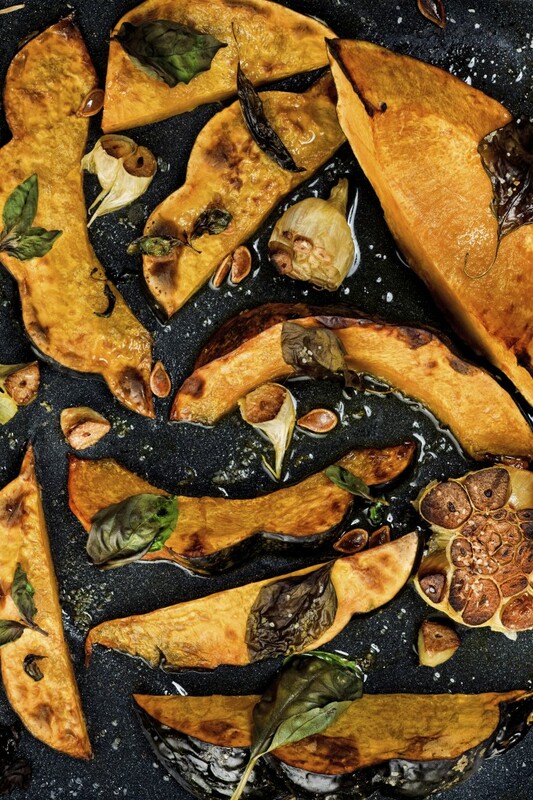 1) Toss pumpkin pieces and garlic slices with oil and salt in a small bowl. Spread on a cookie sheet, bake until tender and slightly browned; about 30 minutes. If garlic begins to burn first, remove from pan and set aside. 2) Place kale, oil and Roasted Garlic Sea Salt in small bowl. Massage oil and salt into kale leave to break down the fibre and slightly wilt. Note: Kale can be lightly sauteed in a pan for a warm salad. 3) Toast pine nuts in oven until browned (about 3-4 minutes) or a cast iron frying pan on the stove until toasted. Due to the high oil content in the pine nuts, this process takes only a few minutes. 4) Dressing: Emulsify the Apple Cider & Garlic Vinaigrette, Maple Syrup and Dijon mustard to a smooth paste. Season to taste with salt and pepper. 5) Toss kale leaves with half of the dressing and the feta cheese. Arrange on salad plates. Place pumpkin strips on kale. Drizzle remaining dressing over pumpkin pieces. Garnish with pine nuts.